To address the impact of PSOC on deep-cycle batteries in renewable energy (RE), inverter backup and telecom applications, Trojan Battery has now included Smart Carbon™ as a standard feature in its Solar Industrial and Solar Premium flooded battery lines. 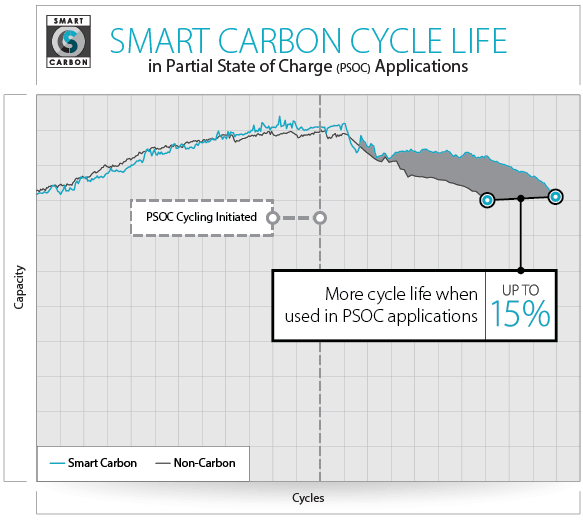 Based on more than five years of research and development by Trojan’s engineering team, Smart Carbon is Trojan’s proprietary formula which provides improved performance when the batteries operate in PSOC, enhancing overall battery life in applications where the batteries are under charged on a regular basis. The addition of Smart Carbon builds on Trojan’s commitment to provide deep-cycle batteries that offer long cycle life, durable design and consistent power day in and day out.